I might be a hoarder. I have a larder. A pantry. I put up food. I might need a 12 step program. Yeah. And look at the winter we just had. Right now, I need to come clean, though. In order to get control of my preserving nature. Because it’s possible I’m just a whisper away from being a hoarder. I have enough fruit liqueur for a long time. I will not make more booze this year. Or next. I still have at least 10 quarts. That’s a lot of sidecars. I have way too many jars. 36 jars of salsa is too many. 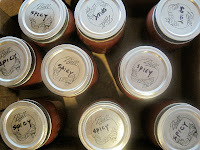 12 quarts of crushed tomatoes was not enough. 24 would be better. This is what it looked like at the end of summer. 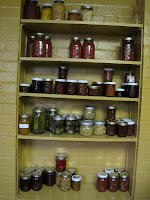 Of course, this is just the foods-in-jars larder. And then there is the freezer. The chest freezer: one cubic foot of wonderful. Packed, and therefore impossible to see into, it holds many wonders. During the Snow Storms Of The Century, the three times we were snowed in for more than two days, the larder came in pretty handy. There were lovely flash frozen haricot verts from last summer. Chestnut flour raviolis filled with sweet potato and ricotta. Lamb shanks – just add two quarts of crushed tomato, wine, herbs. Boudin blanc, served with mashed potatoes and prunes. Ragu. Pizza sauce. Homemade bacon. Pork shoulder. 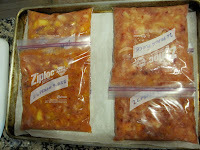 Frozen peaches (heavenly in February!) Corn, cut fresh off the cob, and flash frozen to be roasted and mixed with black beans. OK. I’m done crowing. But here’s what I’ve been thinking. Wouldn’t you like to feel a little smug next winter? 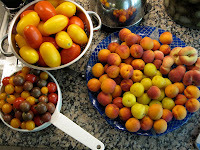 Want to join me for a season of small batch canning and preserving? Can-o-Rama 2010. You’ll be keeping me on the straight and narrow. Really. I’ve started with mango chutney and I’ll post that recipe tomorrow. 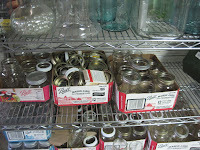 Ball Jars with lids that seal, various sizes. 1 pt is most useful. 1/2 pts are nice for jelly. Large stock pot for sterilizing – 12 quart is nice – I found All Clad at an outlet store. I like the stainless pan for cooking tomatoes and salsas. I was browsing your site after commenting on your risotto and I noticed your locale – I'm so incredibly jealous because every year I think about the cherry blossoms. My one visit to your neck of the woods was around the first of the April, and it's the only memory I keep. I hope the winter didn't ruin any chances for the blooms! Cuppy – Thanks so much for stopping by. 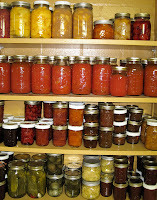 I hope you got a chance to read the post about canning with the women in my family. Yes, indeed, I grew up with lots of women who canned, and that's no doubt why I'm doing it too. Cherry blossoms will be at peak around April 4th. My cherry tree will bloom about a week later. Can't wait. Spring has definitely sprung.